Today I'd like to pay homage to the most comfortable shoes I own - Aquatalia by Marvin K's 'Xcellent' bootie. I'm the type of shopper that laments over an item obsessively for days or even weeks until I can't resist any longer and I go in for the buy. But, as soon as I slipped these on my feet I said "wrap 'em up!" The $350 price tag would usually cause me much deliberation, but after multiple 12 hour days walking around city streets in these babies and not a single blister, so the money has been more than justifiable. Now don't get me wrong, these booties aren't big statement makers, but they are totally unoffensive and the perforation and notch detailing at the ankle give them enough style that you don't look like you are wearing "comfort" shoes. I've worn them in rain and they are light weight enough that I'll be wearing them come shine as well. Below is how I styled them over the weekend for an afternoon in San Francisco with friends. Moral of the story? If you care about your comfort and have the money, these Aquatalia by Marvin K booties are an investment you won't regret! I have a similar pair of boots from Steve Madden that are so comfortable too! I love that they give me a little height (always needed) but don't hurt my feet to walk in. 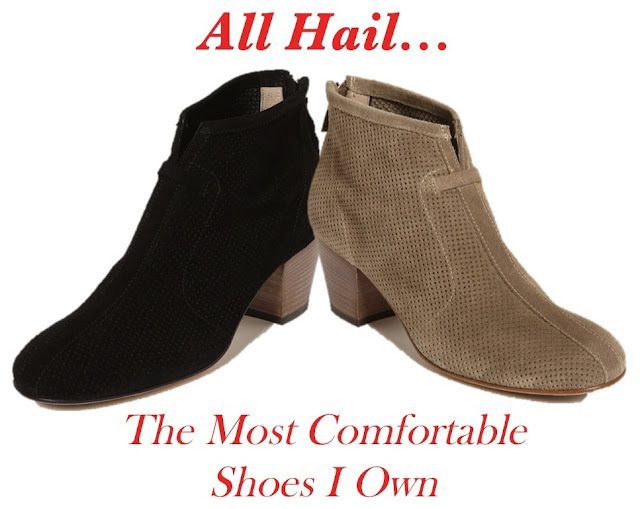 I have been looking for the perfect black booties!! I love a comfortable shoe recommendation! It is so hard to find something pretty that you can also look pretty walking in. Lovely boots! I love the outfit you put together. I just posted a new OOTD post. What do you think?! I do love a good stylish pair of booties- been on the lookout forever- espesh in SF!! I need a pair of boots like these. I have a few pairs of suede Goretex Aquatalias -- comfortable and you can wear them in the rain. Found them on sale sale sale at Neiman Marcus, pure luck.